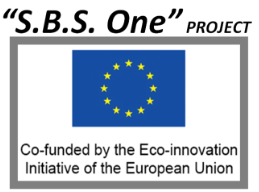 The project objectives are the reduction of waste, moderate the use of chemicals and to contain CO2 emissions using an innovative method of minimal tolerance dehumidification (-5%) during PVC production. The current dehumidification methodology of PVC both during the process of compounding and of extrusion is inadequate. The residual moisture during the PVC preparation and production phases creates phenomena of hydrolytic degradation catalysed by the thermo-mechanical forces, manifested through the presence of imperfections (double bonds, carbonyl and hydroperoxide groups) and formation of sequences of conjugated double bonds. During the extrusion phase, then, the material to be treated absorbs further moisture, which can result in further processing waste, machine downtime and extraordinary maintenance. A remedy lies in the use of stabilising and plastifying chemicals in over quantity (+ 30%) compared to the normalised situation, i.e. without moisture during the cycle. During this phase, the production of the granule can be partially compromised with waste formation (15% of overtreated products). Moreover, in the presence of moisture, even if very slight, the effects of degradation are still present, causing additional waste that, in the case of material intended for biomedical use, can reach a further 10%. The introduction of an innovative way to measure in real time moisture content of the materials, and to tailor the demoisturizing treatment from case to case would represent an enormous benefit, able to completely nullify the need for overtreatment and the related problems. There are numerous results expected that relate energy saving, smart use of raw materials, minimisation of the production of waste, even if recyclable, reduced use of chemicals and optimisation of the production cycle: - Lower CO2 emissions: The new system, immediately adjusting the moisture contained in the material, will be able to save the thermal energy necessary for dehumidification aiming for cost savings of 50% of emissions in CO2 equivalent to 280 ton/year. - Removal of production waste: The incorrect and inefficient dehumidification cause irreversible damage to raw materials and to semi-finished and finished products, creating inefficiencies and production of waste (285 ton/year), which, during recycling, consumes energy creating intolerant CO2 emissions (ab. 116 ton/year). - Savings and recoveries of raw material: The redesigned production cycle will enable precise shimming of the film with micrometric tolerance, reducing the use of raw materials. Moisture control will remove the risk of transforming material that is unsuitable, recovering it intact before transformation. The full recovery of the waste materials, perfectly compatible with the virgin material, will also save raw materials and CO2 emission (97 Ton/year). - Less use and waste of additives: The additives (plasticisers, flame retardant, catalysts in general) are the first to be volatilized during drying in case of over dehumidification and this requires a superabundant use. A balanced moisture of the materials will permit to use the amount strictly necessary, allowing an average percentage of reduction of 30%. - Constant control and optimal management of the quality of the products: The constant moisture and thermal control of the material will enable prior definition of the fundamental process parameters, offering protection on weather situations (temperature and external humidity changes). The environmental problem addressed is the presence of moisture in recycled polymers and technopolymers, which has detrimental effects on their processability and is responsible for the need of multiple treatments and of the generation of waste or, viceversa, for the need of using plastifying additives to try to recover part of its properties. The dimension of the environmental problem is huge and growing, as it is huge current market and use of plastics and considering that when recycling the polymer, prior to reprocessing, it is mandatory to reduce the water content below 100 ppm, if not the reprocessed materials will be stained by milky areas, spoiled by bubbles, and will present much lower mechanical properties and durability: it would remain waste. For this reason, during last decades, more and more advanced de-moisturizing systems have been used, using hot air, electromagnetic fields, vacuum, but all characterized by an extremely low energy efficiency and by the generation of overtreated products, with detrimental effects on some portion of the recycled materials or granules which are directly exposed to the more intense heat or electromagnetic field action. 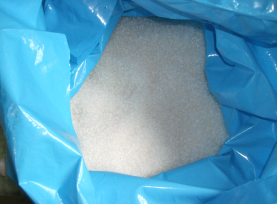 The overtreated materials present reprocessability problems, in particular regarding viscosity loss and yellowing, which force the manufacturers to add plastifying agents to compensate for this which are one of the major source of pollution for polymers. Moreover, this recovery of overtreated materials implies that new materials and more energy is used in their reprocessing. The introduction of an innovative way to measure in real time moisture content of the materials and to tailor the demoisturizing treatment from case to case, avoiding the use of rough processing parameters during de-moisturizing, would represent an enormous benefit, able to completely nullify the need for overtreatment and the related problems. Mass and energy balance of the new dehumidifier, to be compared with current similar systems. The main result is a functioning de-moisturizing pilot plant, including sensors, conveying systems and de-moisturizing unit: costs and products proved to be compatible with an industrial production, permitting important environmental and economic benefits. - The new system is able to immediately adjust the moisture contained in the material and so can be saved most of the thermal energy necessary for dehumidification, allowing to use only the energy strictly necessary to achieve the goal of dehumidification and systems largely less-consuming than current ones, thereby allowing reductions measured between 55 and 60 % of total emissions in relation to the type of raw material processed, i.e. up to 400 tons/year CO2 with the pilot plant for the project saved. - The incorrect or ineffective dehumidification actions lead to irreversible damage in the intrinsic qualities of the raw materials that are transposed as such even in the finished product where it will be mapped, causing in all cases product waste. Waste amount is never lower than 285-300 tons/year in business perspective for only the overtreatment of the materials with consequent abnormal emissions of CO2 equal to 116 tons/year that will be avoided if waste will be eliminated. Within the project can be saved about 28-30 tons per year of production waste which can become 45-50 tons considering the troubles created often by the moisture in the materials during extrusion and so when the dry blend is converted into gelled material. In the latter case, other 20 tons/year of CO2 emissions can be saved. So, about 25% of waste, i.e. 50 tons/year, can be not generated on the 200 tons per year treated by the pilot plant. - As regard energy consumption, can be said that the new system reached important results consuming only 30 kj/kg for the de-moisturizing unit, not present in the traditional process (ref. 1000kg/day of material treated). This latter data have to be compared with the 1900 kj/kg necessary to recycle 150 kg of waste per day produced without moisture control. Moreover, even if some process phases have been added, the whole process has better performances consuming only 0.14285 Kwh/kg instead of 0.158 Kwh/kg of the traditional process with no de-moisturizing units. - Moisture control upstream of the granulation can remove the risk of transforming material that is unsuitable, recovering it intact before transformation and permitting to save raw materials. The new method can so allow the full recovery of the waste materials making them perfectly compatible with the virgin material thanks to the possibility of homogenising the water gradient with the relative viscosity control. - Less waste of additives: the additives (stabilizers, lubricants, plasticisers, flame retardant, catalysts in general) are the first to be volatilised due to problems of drying in the event of over dehumidification and this therefore requires a superabundant and prudent use. Balanced moisture of the materials permits to use only the amount strictly necessary of additives. Several tests with different mixtures demonstrated an average percentage reduction of 30% in use of chemicals additives, achieving perfect quality products with great homogeneity of granules (standard deviation of moisture: 1%). Considering that per kg of material treated on average 0.65 kg are main resins and 0.35 kg are additives and that 0.015 kg of the latter are additives that can be saved with the project up to 35-40% (30% on average) get 900 kg of chemical additives usage saved per year only with the pilot plant on average. The proposed approach is more economical than the current one. The main economic results concern the direct economic value generated (about +10% estimated) mainly reached thank to the reduction of energy costs and the increase of productivity (less waste) and company image on the market. The minor production cost can be attested of about 9%; considering the improvement of company image that impact the selling price can be estimated a 10% of added economic value. organization of a final promotional event, to be held during the last month of the project. The activities of the project focused soon on the sensor used to measure the material moisture. The sensors have been dimensioned, designed and realized taking into consideration the possible materials to treat and the various plant to be update with. Something more had to be faced for the implementation of the sensors on the plant, since the position of both the sensors, input and output material moisture measuring, needed more attention than expected. 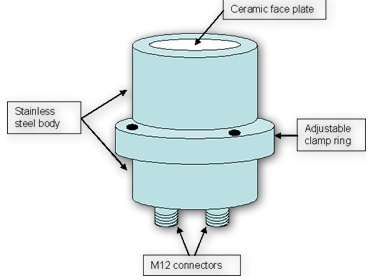 The sensor had been initially installed near the area where the metal mixing blades move and this caused interference and distortions in the signal, resulting in errors in the measurements. 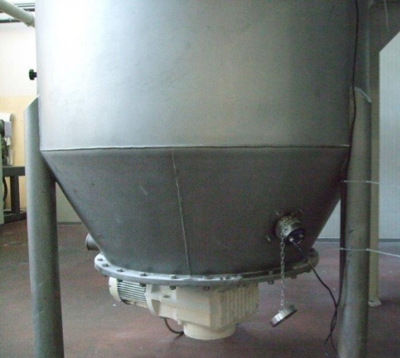 We decided so to reposition the sensors, establishing that it would be useful to install one inside the turbo mixer in order to monitor the moisture content during the mixing of the raw materials and, possibly, also changing the processing parameters immediately in order to correct any anomalies. The other sensor, meanwhile, measures the dry blend within the temporary storage unit at the cycle-start phase. The activities aimed to realize the hardware part of the de-moisturizing unit to ensure proper and efficient water removal from the polymer, based on the information acquired by the sensors network, followed. The application of hot air was so tested in the compound sieved with the time of dehumidification determined, with good results, but with necessary stop in the production in continuous. 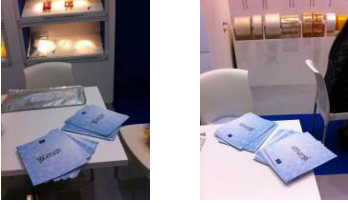 As an alternative to the off-line system, therefore, the company has studied the possibility of managing the optimal dehumidification within the process "in line". Have been so assessed all the variables/causes of the formation and development of moisture within the process. The main source was detected in the reactor turbo-mixer where the inconstancy of parameters (critical is temperature) results in the continued development of vapours and gases. 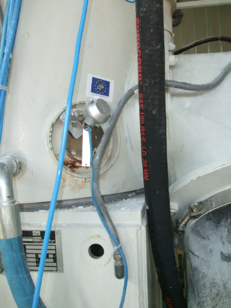 In particular, the new system was born by inserting a cooling circuit within the reactor turbo-mixer sleeve, integrated with the boot process ("start cycle") of the preparation of the compounds. Then, through sensors arranged within the reactor turbo-mixer sleeve has been arranged an exchange with water that would allow to bring the temperature always in the state of "system startup" thus avoiding that the raising of the same temperature busted development of moisture of the mixture inside the reactor turbo-mixer. Properly the compound is formed by a liquid phase and a solid phase and is polymerized by a cycle of 15 min with a temperature ramp from 45 °C till 105 °C. The combination of an integrated system between the new process described above and the sensor placed downstream of the storage buffer unit has made possible a continuous production system with the optimal conditions of dehumidification to reach target process. The system has been so validated with several tests and put into security guarantee through the sensors realized that permit to prevent the "cycle start" if the critical temperature parameters within the turbo-mixer and the percentage of residual moisture are not respected. The following activities aimed to provide the necessary on board intelligence to the new system, in order to be able to process any kind of input polymers at any kind of moisture content. Through the control system, dehumidification must be parameterized on the basis of data collected in the flow of raw material physic-chemical parameters, to the environmental conditions for an immediate answer and a re-modulation of dehumidification cycle also in function, precisely, of the characteristics of the raw materials in transit. 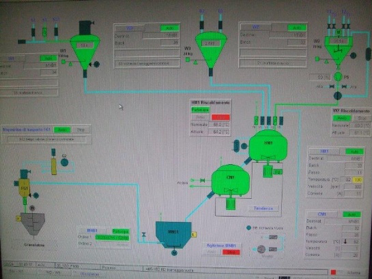 The control unit has been implemented linking the control system of the process with the one that control the sensors’ network, realized specifically within Meditalia processing and measurement and modified to meet the common control software for processes like Meditalia one, to have a single control system for the whole process. The aim was to increase the possibility of widespread the technology realized and to contain the applicative and operative costs, as well as, of course, to optimize the process as better as possible. The basic concept of operation of the new process is based on the control of the turbo-mixer temperature and the sequences and times of entry of the solid and liquid components into the turbo mixer, modulated and controlled to ensure a production in constant quality assurance. Probes were then inserted into the process integrated with the production software to ensure process homogeneity. 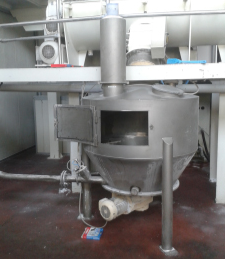 Each process has therefore been customized according to the 5 product families, modulating the reception times of raw materials, the injection times of liquids and controlling in an adaptive way the temperature at the beginning of cycle and at the end of cycle of processing inside the turbo mixer. The work cycles determined are all documented within the program developed for the management of the mixtures. On tests of the incorrectly dried materials, the parameter was measurable directly on the machine and the effect was visible due to continuous burns and downtime caused by excess of humidity. With the pilot plant, the material can be put into processing on monday mornings and continue without interruption of the process until the shutdown on friday evening. The saving of stoppages due to the continuous burning of the material in the extrusion process has allowed to significantly reduce the process waste and the time lost for the continuous shutdowns and restarts of the production line.